Above: The HEPA Filter removes as much as 99 percent of the dust from the air that travels through it. Dust is a reality with any remodeling project, big or small. HEPA Filter gobbles up dust at a remodeling job site. At Neil Kelly, air quality is a big concern, not only for clients and their property, but also for job sites and crews working in them. In 2016, Neil Kelly began deploying the BuildClean HEPA Filter at its major construction sites throughout the Pacific Northwest, affirming the company’s commitment to create dust-free work environments with high-performance air filtration technology. According to U.S. government standards, the HEPA — or High-Efficiency Particulate Arrestance Filter — must be able to remove 99.97% of particles larger than 0.3 microns from air passing through. To put that figure in perspective, a human hair is about 50 microns in diameter. The HEPA Filter was originally developed during the Manhattan Project in the 1940s to prevent the spread of airborne radioactive contamination. Since that time, HEPA Filters have been used successfully in biomedical and pharmaceutical facilities, aerospace and automotive industries, and in high-tech applications such as integrated circuit fabrication. In a remodeling or construction application, HEPA Filters are capable of removing up to 90 percent of airborne dust, dramatically improving livability for everyone that has to be near the work. Even in the worst environments, the HEPA Filter can clear the air in as little as 3 minutes. “You can just see the dust going into it — it’s the most amazing thing,” said Stan Friesen, Neil Kelly Project Manager. 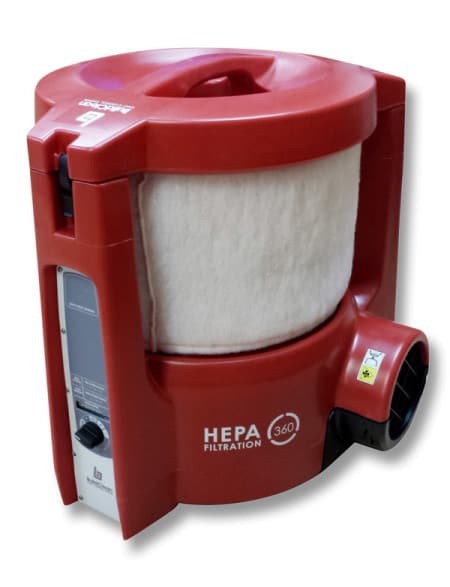 In 2018, 23 HEPA units were in operation throughout the company. Among Neil Kelly clients and employees, the response has been overwhelmingly positive.